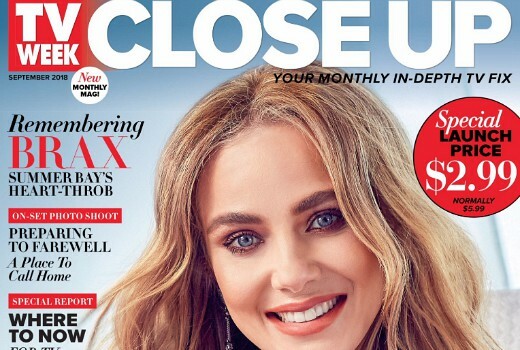 TV Week launches new monthly mag, Close Up. Bauer Media has launched a new monthly magazine TV Week Close Up, offering extended interviews and behind the scenes access. On sale from tomorrow, the mag will launch with an introductory $2.99 price before rising to $5.99 monthly. Long-running TV Week will remain on sale as a weekly title. The launch edition features stories on Jessica Marais, Home and Away‘s “Brax”, A Place to Call Home, Hamish & Andy, Sam Frost, Julia Morris, Streaming TV and the state of TV drama. Recent media reports claim Seven-owned Pacific Magazines had been poaching journos from Bauer’s TV Week, causing some trade friction. do people even buy magazines anymore? More garbage invented by so called journalists ?? TV Week hasn’t ever been lumped in the same sentence as New Idea or Woman’s Day? I thought that girl was an old Kylie Minogue pic – a vintage picture from Neighbours. Cheap toilet paper, although mightn’t be that comfy. Harsh! Should at least check first edition. You obvious don’t do the shopping. Another Bauer publication for Rebel to sue. I was really surprised by this. Why? Magazine sales are falling and there’s just no need for another magazine. Why buy this crap when we have, I don’t know, TVTonight as a more reliable and trusted source of information? Cover design looks much better than the mis-mash, crowded covers of regular TV Week covers – tho they could have held back on the Photoshopping of Jessica!!! Keen to see what behind the scenes info it has on Jessica Marais pulling out of Logies. That will be the journalism test. That’s what I was thinking re: photoshop. She’s unrecognisable, I thought to myself “that girl looks slightly like Jessica Marais, she must be on one of the soaps”, but nope, it’s her! !